Radiance Space Solutions offers the entire suite of professional housekeeping services in DelhiNCR. These include housekeeping services in Gurgaonand housekeeping services in Noida, serving for commercial, retail and institutional spaces. We are widely recognized as one of the best housekeeping service company due to our sincerity and professionalism towards work along with our unique style of operations that differentiate us immensely. As a modern housekeeping service provider, we have trained professionals and the right set of equipment’s that help us to carry out a range of services with upmost precision and care. We at Radiance strongly believe that, tidiness and cleanliness are essential for harmony and peace of mind at your work and retail space. Hence, it is essential for companies to create the right environment for efficiency and productivity at work place while maintaining a clear brand image. Professional Housekeeping services from Radiance enables our clients to keep their environments not only spotlessly clean but also absolutely hygienic throughout. Our comprehensive solutionsand reliable housekeeping services in DelhiNCR including regions of Noida, Gurgaon and othersensure that our clients receive trained, pleasant, and well-groomed crew for all the above service categories.Thereby, enabling our clients to focus on their core competence and grow further. Our unique differentiator is our style and process of recruitment of the right candidates to best suit your exact requirements. After a detailed discussion with your team and complete understanding of your organizational culture, do we clearly define our scope of work and conduct preliminary interviews to shortlist suitable candidates for the roles. Then, selected candidates are trained as per your organizational culture with special emphasis given to grooming, behavior and personal hygiene. This ensures only the best candidates to reach your doorstep to carry out streamlined housekeeping operations. Thus, making us rank amongst the best companies for providing customers with ace housekeeping services in Delhi. 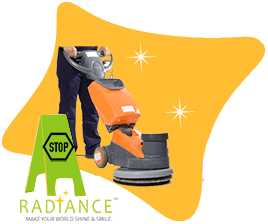 Instead of the traditional methods and chemicals that are hazardous to health and environment, we at Radiance, only follow the finest housekeeping practices at the premises of all our esteem clients. This includes employing highly trained professionals that are well groomed and have in-depth knowledge relating the use advanced grade tools and world class mechanized equipments. We use only internationally approved & certified, environment-friendly, and non-hazardous cleaning agents which are 100% safe for all employees, visitors, and other stakeholders. Another unique differentiator is that we go beyond traditional surface cleaning to provide detailed cleansing, sanitization, as well as sterilization of our client premises and have, hence enveloped a multitude of value added benefits for our clients. These include certain number of specialized cleaning visits as per the condition and requirements of the clients. A detailed seclude of the benefits along with their commercial evaluation to showcase the cost saving and freebies the client receives, is presented to them along with the proposal. This is a revolutionary new practice exclusively offered by Radiance in the facility management domain. Our service program includes multiple site visits and inspections to maintain quality standards. These include frequent audits and trainings at site followed by employee engagement programs. This develops a culture of belonging amongst the workforce and motivates them to perform better. While executing the cleansing tasks, our housekeeping professionals take enough care not to cause damage to any goods & items present in the room. We have tremendous experience of working with premium materials and delicate spaces and handle your items with utmost care and professionalism while delivering outstanding housekeeping services in Gurgaon, Noida and other parts of Delhi. Each member of our team is vetted and is absolutely trustworthy. All personnel deployed are background verified with proper documentation. This ensures complete peace of mind for our clients and their workforce. We pay all our employees very handsomely with all legal and statutory compliances in place as per Government norms. This enables us to curb attrition and retain good talent in the organization. Documentation of the same can be presented upon request. A designated Single Point of Contact (SPOC) person is nominated for each client to ensure streamlined connectivity. This ensures round the clock (24X7) support to all our clients with a quick turnaround time of less than 24 hours. Are you searching for office housekeeping services? Not completely satisfied by the quality of housekeeping services you are currently receiving. Upgrade yourself to professional housekeeping offered by Radiance and experience the difference yourself. With the very first meeting with our skilled executives, you shall be able to see the value that the housekeeping services by Radiance intends to provide. Take a trial of our preeminent housekeeping services in Noida along withGurgaon&Delhi and you will have to look no further. © Radiance® All Rights Reserved.